Shuswap Lake, BC. Shuswap, British Columbia. Houseboating & Vacations on Shuswap Lake, BC. 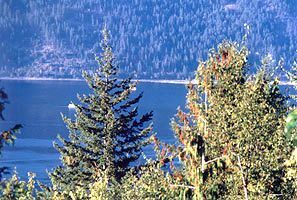 Shuswap Lake, "The Houseboat Capital of Canada" is a mecca for swimmers, waterskiers, fishermen, nature lovers and boaters alike with it's 1000 km (620 miles) of beautiful shoreline, sandy beaches and marine parks. Those interested in exploring the surrounding areas will find the rolling hills and dense forests a natural paradise. There are eight park/activity/camping sites on Shuswap Lake's arms. These include Salmon Arm, Sicamous, and Sorrento. Access to the lake is via the TransCanada Highway #1 in BC's High Country region.